PLATOTERM for Atari 8-bit Computers - Testing Version 1.2 with FAST-IO! IRATA.ONLINE user Sijmen Schouten (aka Mr. Atari) has taken a development build of the upcoming 1.2 release for Atari computers and has patched it to add not only much improved I/O performance, but a built-in R-Verter driver if an R: handler isn't loaded or bootstrapped! Initial testing has been very positive, and I would like any Atari 8-bit users to try it out and report issues! An excellent GCC 1.42 based tool-chain (!) 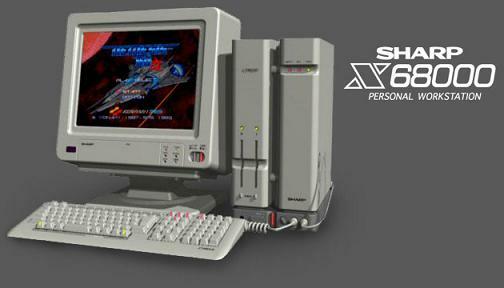 has allowed PLATOTerm to quickly be ported to the legendary Sharp X68000 personal workstation. Since the Sharp X68000 can display a native resolution of 512x512, it displays the native PLATO screen pixel for pixel, without any scaling! Now X68000 users can enjoy using IRATA.ONLINE with their friends from other platforms! PLATOTerm99 for TI-99/4A computers now ready for testing! The TI-99/4A version of PLATOTerm now has a testing release for any TI-99/4A system with 32K of RAM, Disk, and the TI RS232 (or compatible TMS9902 UART). The TIPI version is coming soon! Please test and report back! 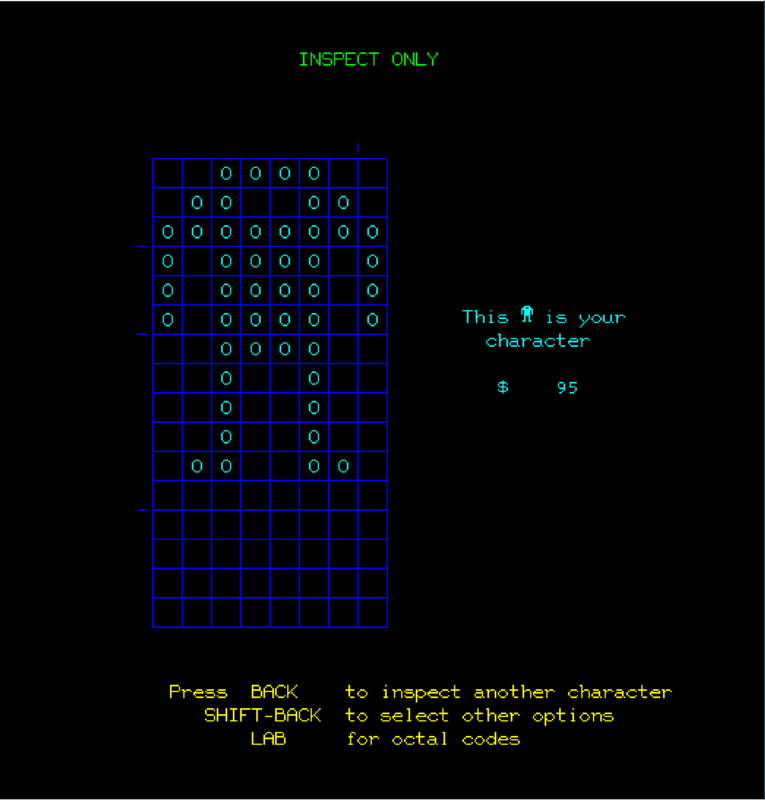 IRATA.ONLINE from a Real ZX Spectrum! 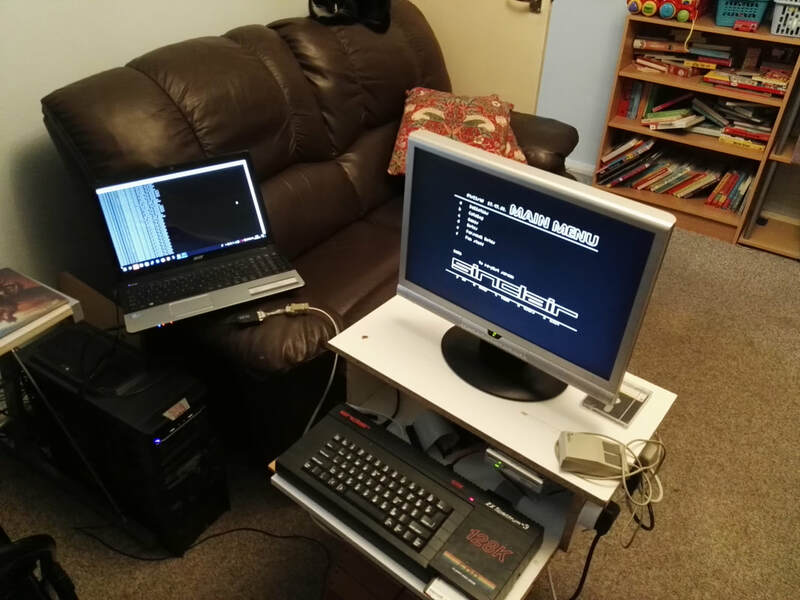 The culmination of two months of work building a Don SuperFo Harlequin 3B kit has paid off for IRATA.USER jthiele / atari, as he has now been able to connect it to a Raspberry Pi running TCPSER and successfully connect to IRATA.ONLINE using the ZX Spectrum version of PLATOTerm! Congratulations! 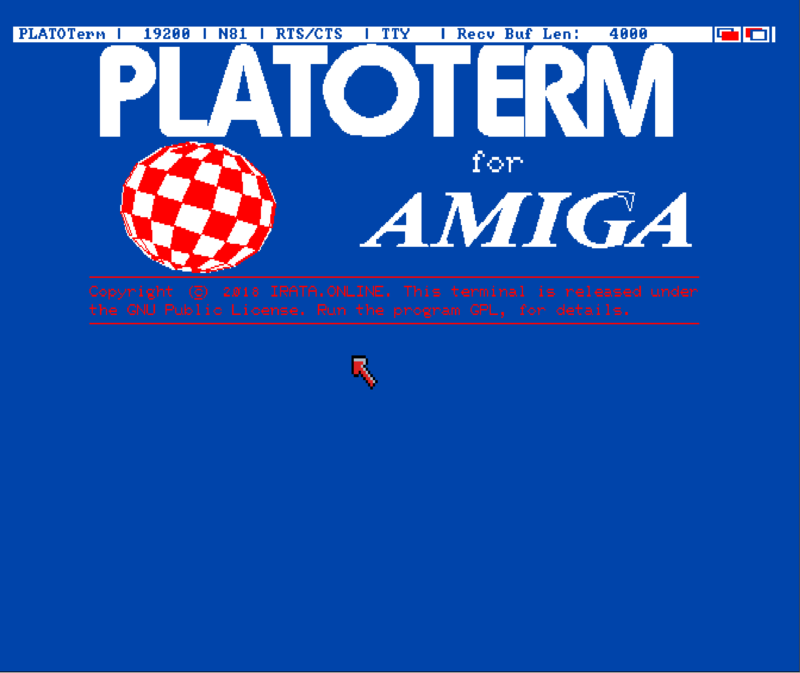 PLATOTerm for Amiga ready for testing! The Amiga version of PLATOTerm is now mature enough for testing. There are two disk images, available. The 1.x version, which includes a bootable Workbench, ready to launch into PLATOTerm, and a disk image for systems with 2.x and above. It uses the AmigaOS serial.device, which can be changed to any desired serial.device, such as baudbandit.device, or telser.device for TCP/IP users! Please download and test, and provide feedback on the github page. PLATOTerm for Atari, C64, C128, and Apple II released. 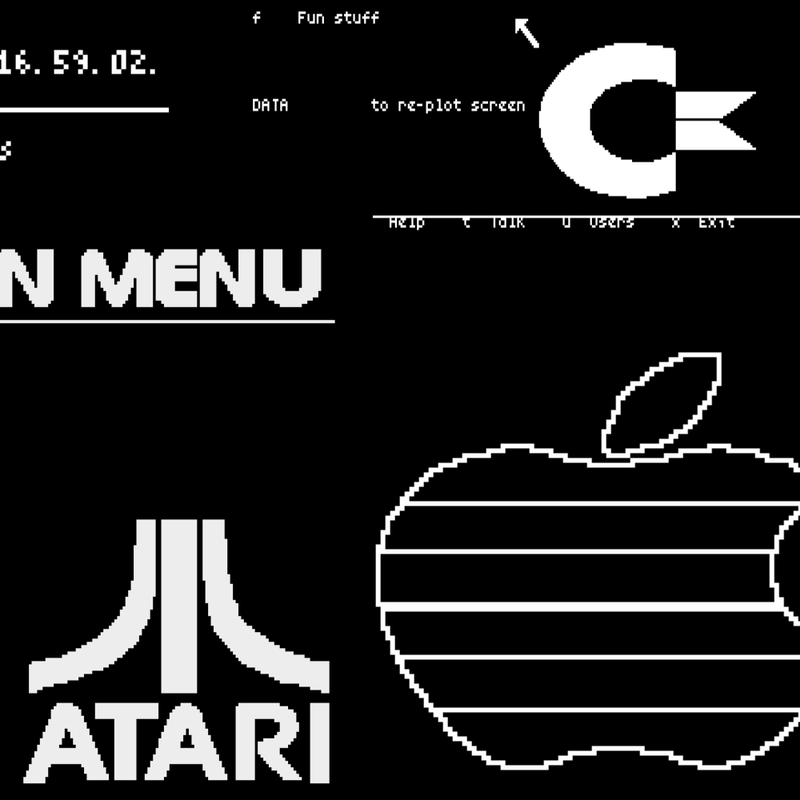 After many long months of development, which started in June, the first official release of PLATOTerm for all the CC65 targets, that is, Atari 8-bit, Commodore 64, Commodore 128, and Apple II has been released. Thanks to everyone who has helped test and make this program as good as it can be. Much more to come! Owen Reynolds, who recently did much needed work on the RS-232 routines for the ZX Spectrum version of PLATOTerm, recounts his newfound experience with IRATA and PLATO. The MS-DOS version of PLATOTerm is now available for testing. You will need an MS-DOS compatible PC and a wifi modem attached to an available COM port, to test. More Information at the release page. New developments on IRATA.ONLINE happen fast! Check the Facebook group for everything from new PLATOTerm ports, scheduling workshops and events, to announcements of new content on the service itself! 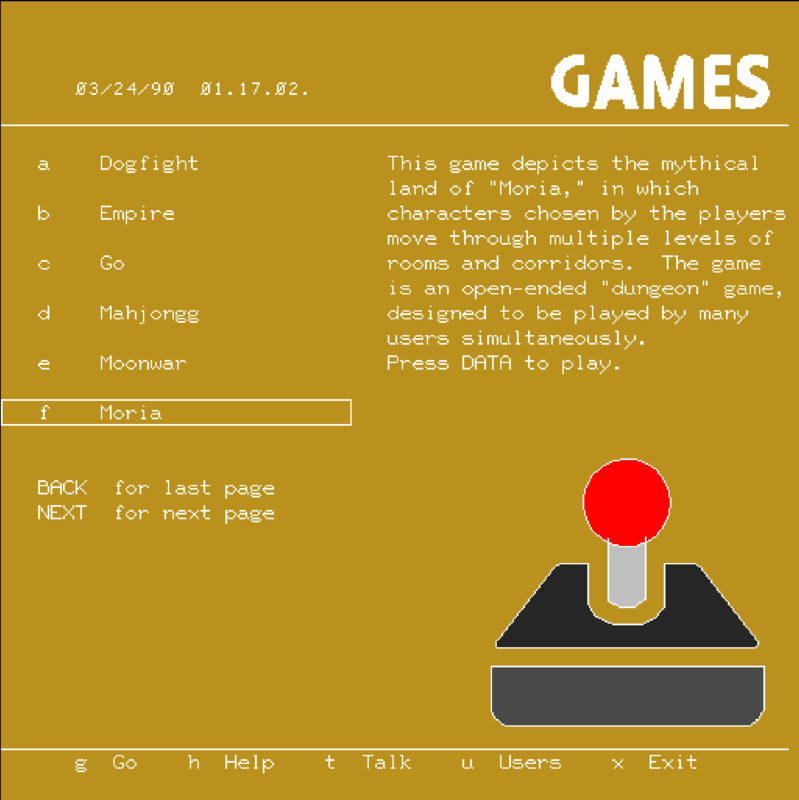 IRATA.ONLINE is provided for the benefit of retro-computing users to have a place to socialize, and develop interesting multi-user, interactive, and graphical games and social applications. It descends from the historical PLATO system, a massive time-sharing system that lasted from 1962 until NovaNET was closed in 2015. Wikipedia entry. It is vital that communities grow, and to that end, IRATA.ONLINE is part of a rebirth of the PLATO system that started with the launching of Cyber1.org in 2004, and is the direct result of the efforts of that community to provide a distribution of the PLATO system that could be run on other systems. 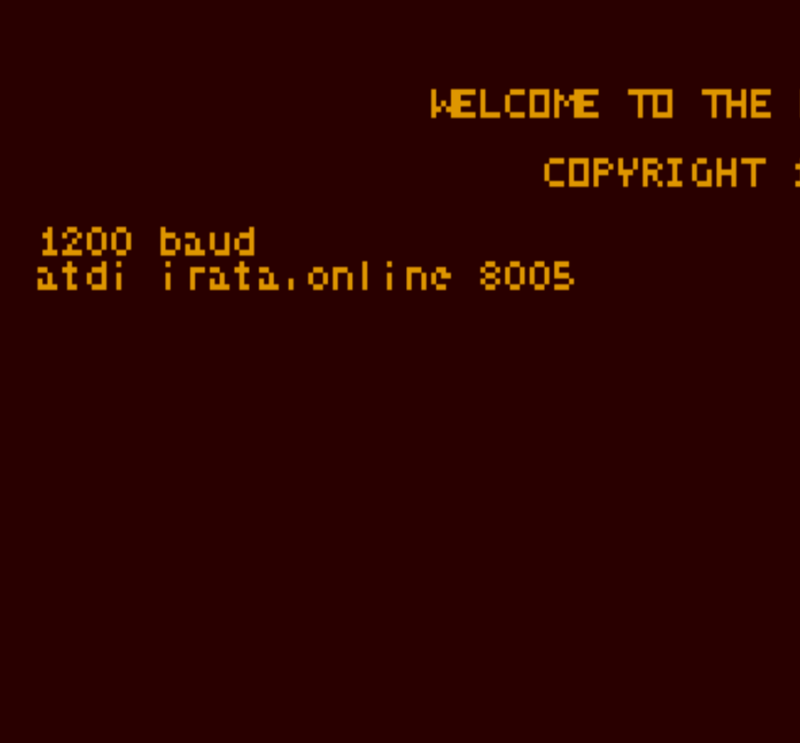 IRATA.ONLINE was initially intended to provide users of Atari 8-bit computer systems a customized experience that was easy to use. It is hoped that with the introduction of more PLATO terminals for other platforms that IRATA.ONLINE's reach can extend even further. Where will it go? Who knows. 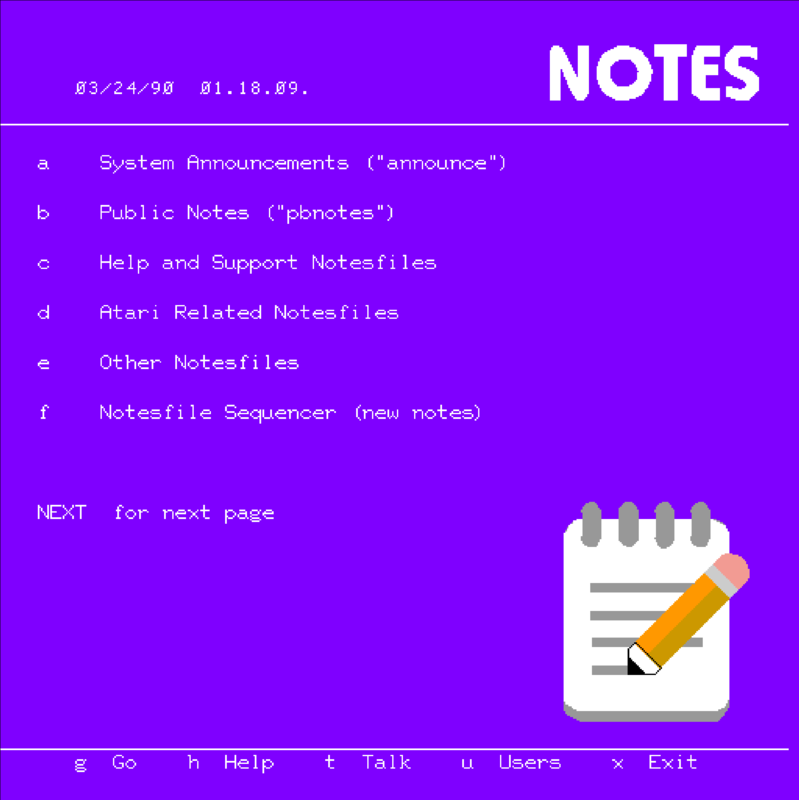 This is an experiment to provide something better than a BBS, by making something that is not only multi-user, but provides a complete social development experience for its users. 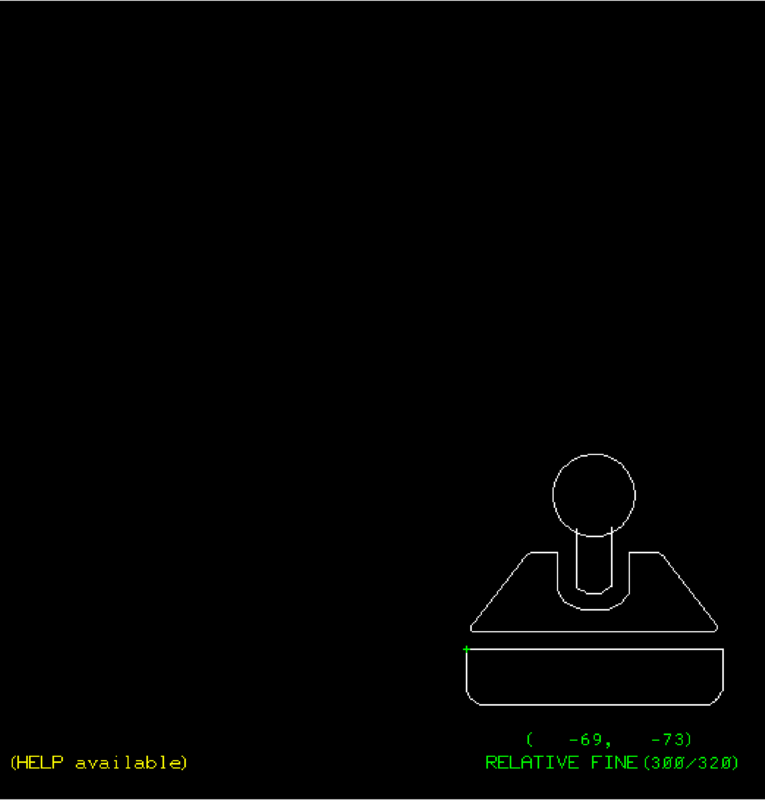 Terminals available for PC, Mac, Linux, Atari 8-bit, and soon Android and iOS. Talk with other users, anywhere in the system, even in games! Help with tutorials to introduce you to the system. Development environment to make new programs for the system. Lots of existing educational content, because it's a PLATO system. Screen sharing facilities, even with multiple participants! IRATA.ONLINE provides PLATOTerm, a terminal emulator for PLATO systems such as IRATA.ONLINE, and CYBER1.ORG PLATOTerm is being ported to dozens of systems, and many targets are already available. The source code is also available for all of these targets, so that the terminal can not only be improved, each target can be used as a concrete example of how to realize a PLATO terminal for a platform currently not covered by PLATOTerm. If you have something else? We not only provide a complete protocol specification, but also multiple complete implementations in C, as well as the source code to the above Atari PLATO cartridge. More details in the TECH section. While this won't give you access to every part of the system (you will not be able to see users, or to use term-talk, for example), it will allow you to see the system, before your account is approved. This is the entry point for sign-ons, which branches out into the other parts of the system. 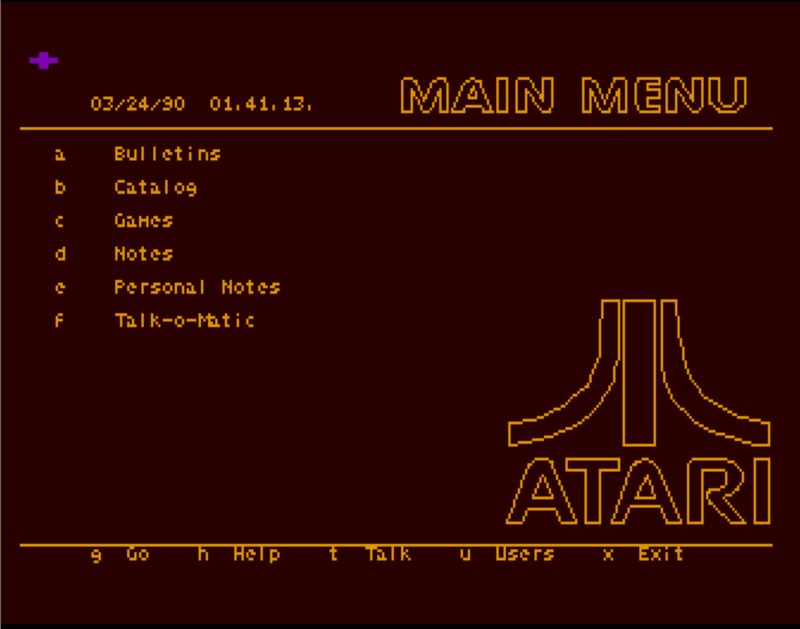 The same menu as shown on the Atari PLATO cartridge. IRATA.ONLINE is a fantastic platform for multi-player online games, many games from the PLATO tradition are available here, with more to come, both from PLATO's past, and from users like you! Notesfiles are the PLATO equivalent of forum posts. Anyone can post and reply to them, and anyone can request for notesfiles to be made. They can be private to a single person, a group or to the public. 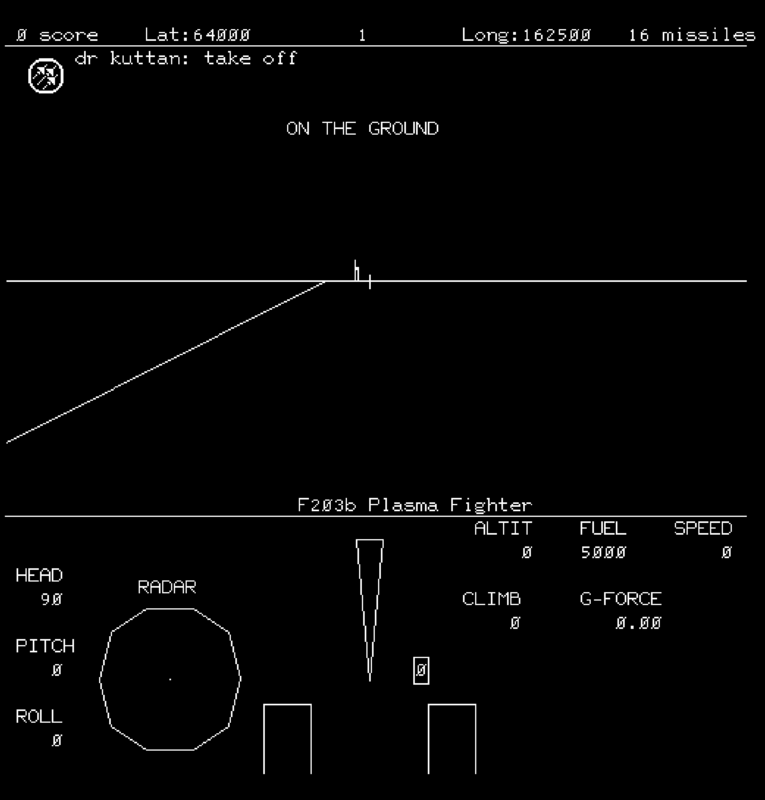 A help menu is provided, with tutorials showing how to use the system. 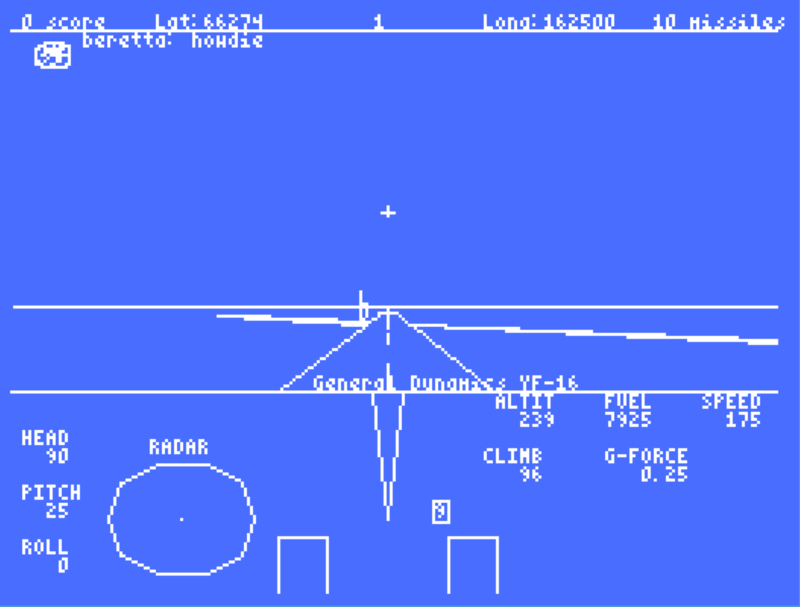 One of the games available, is Airfight, where you participate in a multi-player 3D dogfight simulation! IRATA.ONLINE is written in the TUTOR language, and a complete programming environment, with lots of programming tools, and context sensitive help is pervasively available. 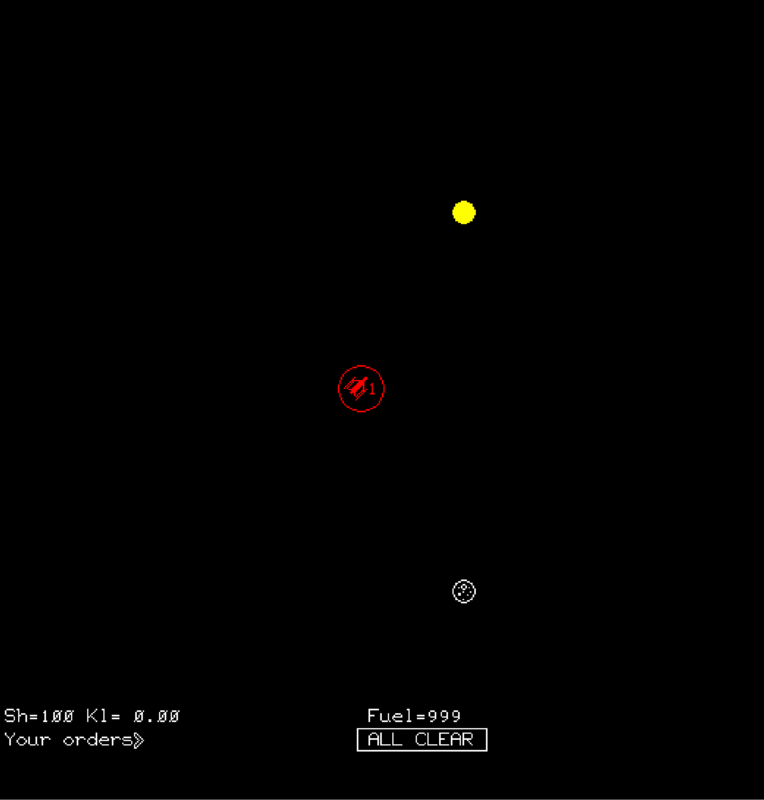 Screens can be visually drawn, and when done, translated into TUTOR code for your game, lesson, or other tool. Programmable character sets are an integral part of the PLATO experience, they allow you to design graphics that can be quickly transmitted, and the system provides a way to create not just individual character cells, but combine them together to produce more complex graphics. 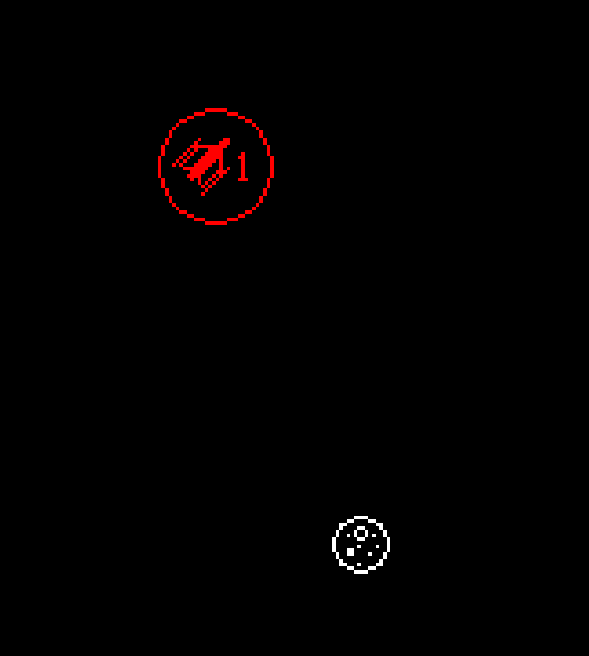 Empire is an example of a multi-player space conquest game. You play various teams, bent on planetary conquest. Here are some example screenshots showcasing the IRATA.ONLINE experience. The majority of these screenshots were taken with the PTERM emulator linked to above. PTERM provides an authentic PLATO experience, either in pure orange and black, or with color! 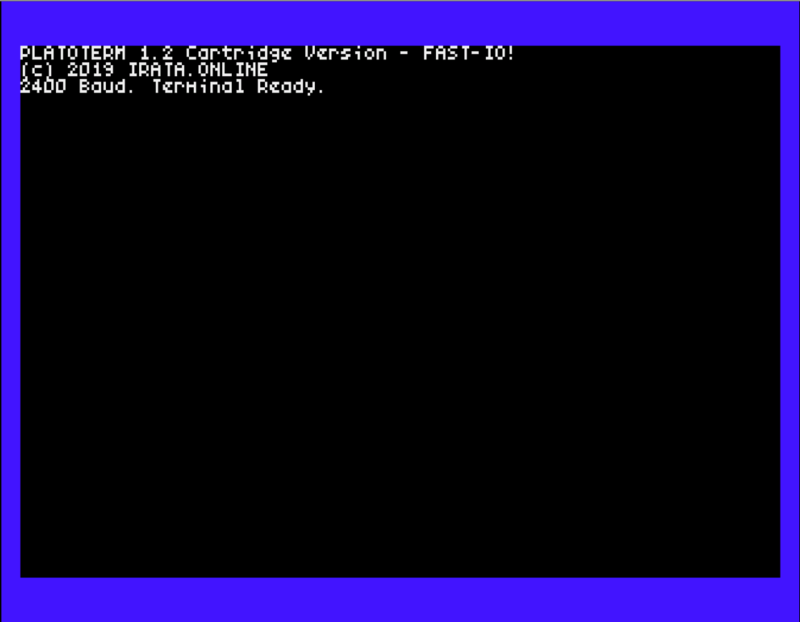 Some screenshots of other terminal emulators, such as the Atari PLATO cartridge, are also included. Shown here is a video providing an overview of IRATA.ONLINE, and its most basic and pervasive features. 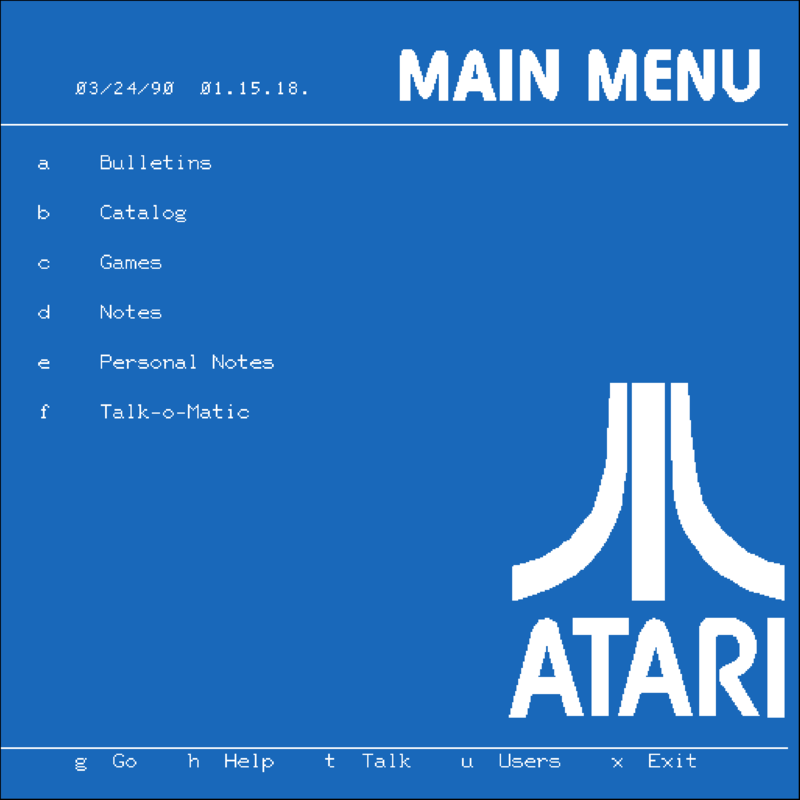 We log onto the system using both the PTERM and Atari clients, and walk through the various menus, showing quickly how notes (and personal notes) work, as well as show a quick glance of the games available, and a quick introduction to the unique programming environment available on PLATO systems. How do I make a terminal for this service? The Protocol that IRATA.ONLINE uses is an ASCII based protocol developed for PLATO. 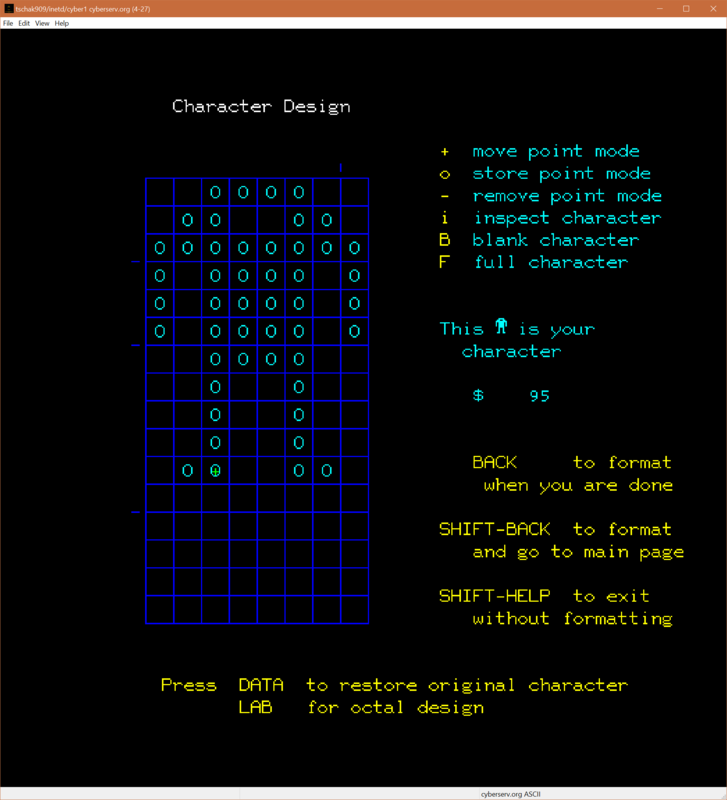 it is ASCII in that it uses 7-bit characters and does not use the 8th bit of the byte. 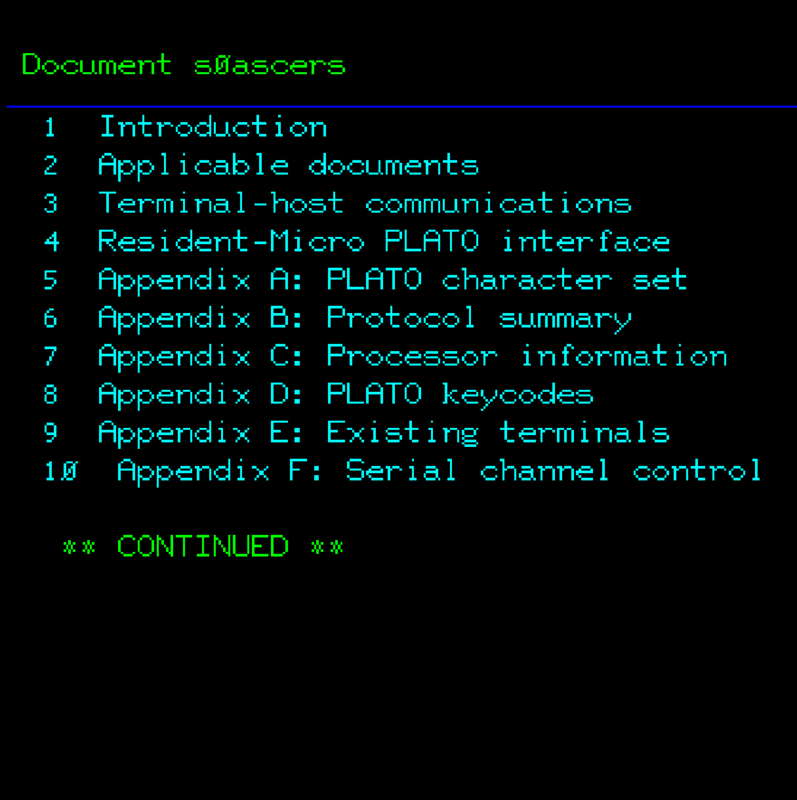 The protocol is completely documented in the "s0ascers" document, provided both below and accessible using either author mode or Go in the menu system. 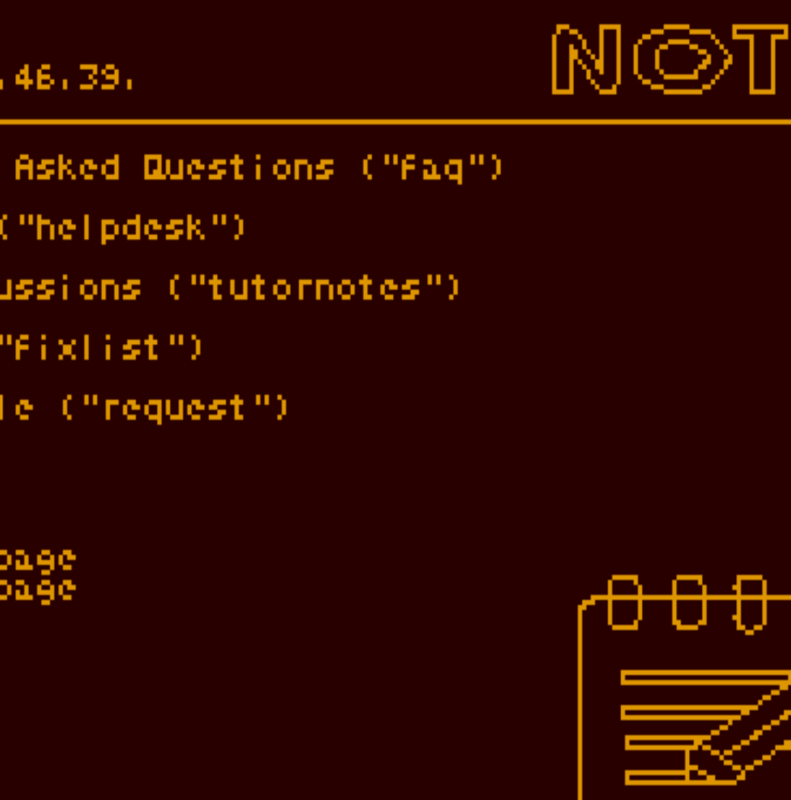 If you wish to make terminal software to access this service, this document is most useful. To help foster adoption of the service, alongside the protocol implementation documentation above, and the pterm source code, also above. 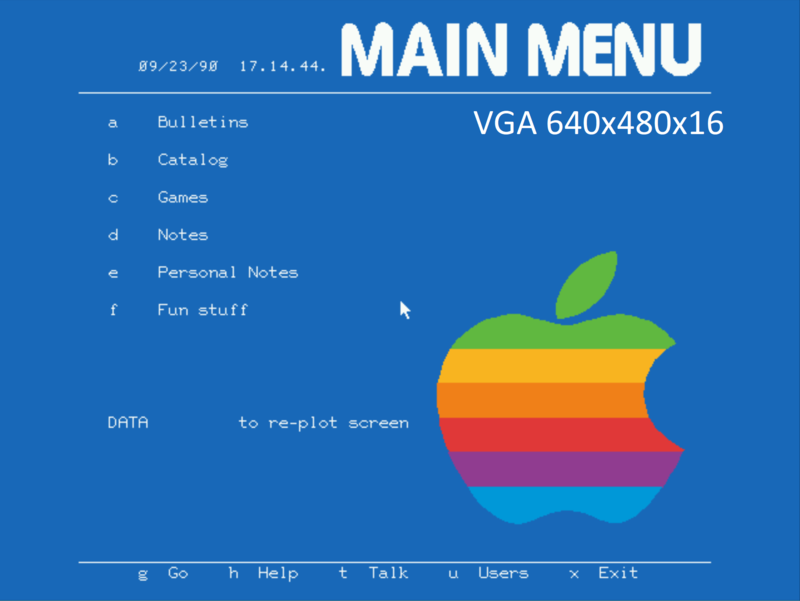 Steve Peltz also provided example implementations of a classic 68K Macintosh terminal (MacPAD) and a Sun SPARC terminal (XPad), both of these are sample implementations written in easy to understand C, that can be brought over to bootstrap other terminal program efforts. A big thank you to Steve Peltz. Atari PLATO Cartridge (The Learning Phone) Source Code at github. 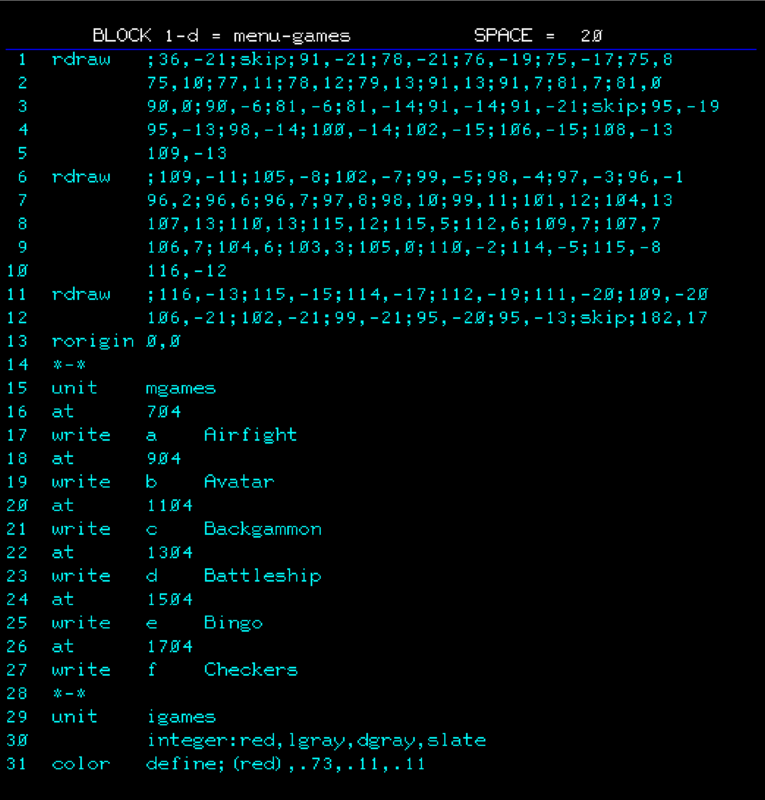 WIP code for a PLATO Terminal written in CC65, which compiles to Commodore 64, Commodore 128, Atari 8-bit and Apple II machines. How do I write software for this service? IRATA.ONLINE like all PLATO systems, utilizes the TUTOR language for the majority of its programs and lessons. It is a very simple language to learn, and is designed to leverage the unique aspects of the service. The editor, debugger, and visual editors needed to make excellent programs for this service, are all built in, and available to users that ask for an Author sign-on. There is also the =0introtut= lesson available from the Help menu and in author mode, as well as the =aids= lesson, which serves as a reference guide. In addition, the fine folks at bitsavers.org and control-data.info provided a copy of The Tutor Language in PDF format, so you can teach yourself TUTOR quickly!